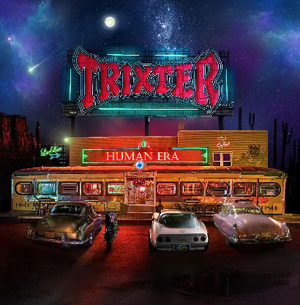 TRIXTER's new studio album, Human Era, is set for release on June 5th in Europe and June 9th in North America. The new track “Every Second Counts” is now streaming and you can check it out below. “After the success of our last album, New Audio Machine, we felt more confident than ever in making another top notch album. I’m so proud to say that after more than 25 years of making records, TRIXTER is getting better and better. Human Era will show the world this band at it's finest,” says lead guitarist Steve Brown. TRIXTER’s self-titled debut album (1990) spawned three hit singles/videos with “Give It To Me Good”, “One In A Million” and “Surrender”, as well as an RIAA-certified Gold album. TRIXTER has toured extensively in the United States, Canada and Japan. TRIXTER has shared the stage with such rock heavyweights as KISS, BOSTON, SCORPIONS, POISON, CINDERELLA, WARRANT, SLAUGHTER, WINGER, SKID ROW, FIREHOUSE, STRYPER, DOKKEN and more. The band recently nabbed the #29 spot on VH-1’s Top 40 Hair Bands of All Time countdown. “Almost 30 years together and the band is tighter than ever! We are family and that makes everything we do more and more special. The title track “Human Era” really sheds insight into our story,” concludes Steve Brown.